Alcohol use disorder, commonly known as alcoholism, is a chronic debilitating psychiatric disease that affects >16 million people in the United States. Disease progression of alcoholism cycles through several different stages, characterized by preoccupation or needing to consume alcohol (ethanol), binge drinking, and withdrawal, and as this cycle continues, the severity of alcoholism becomes more destructive and difficult to treat. Years of research have revealed that the severity of withdrawal symptoms, such as headache, pain, dysphoria, anxiety, seizures and tremor (known as delirium tremens) contributes to the likelihood that individuals seeking treatment for alcoholism will relapse and begin drinking again. Despite this, treating these withdrawal symptoms are difficult as the drugs used to treat these symptoms, benzodiazepines (e.g. Ativan, Klonopin), are also addictive and commonly abused, and when used with alcohol are often deadly. Fig. 1. Chronic ethanol exposure enhances the expression of HDACs that deacetylate chromatin near the Gabra1 promoter to reduce the expression of Gabra1, leading to a decrease in the inhibitory α1 GABAA receptors in the medial prefrontal cortex of rats. The HDAC inhibitor Trichostatin A (TSA) blocks the deacetylation of chromatin, restoring the activity of the Gabra1 promoter and the expression of GABAA receptors. This leads to recovery from the symptoms of ethanol dependence, including anxiety and dysphoria, benzodiazepine cross tolerance and excessive alcohol consumption. HDAC inhibitors could be tested for the treatment of alcohol dependence in patients suffering from Alcohol Use Disorder. Like alcohol, benzodiazepines work by enhancing inhibition in the brain through GABAA receptors, which act as a molecular brake to reduce neuron firing – firing that occurs more frequently during alcohol withdrawal. Research in Dr. Morrow’s lab at UNC Chapel Hill has described how alcohol causes this brake to fail, leading to anxiety, tremors, seizures and increased drinking. We discovered that alcohol alters “the epigenome” that controls the synthesis of GABAA receptors in the brain. The epigenome controls whether the GABAA receptor gene is expressed in neurons by adding chemical modifications to DNA that act as an on/off switch. Alcohol turns off these chemical modifications which results in fewer GABAA receptors in the brain and more severe withdrawal symptoms. To stop this process from happening, we used a drug that corrects the ethanol-induced changes in the epigenome and restores the expression of GABAA receptors. 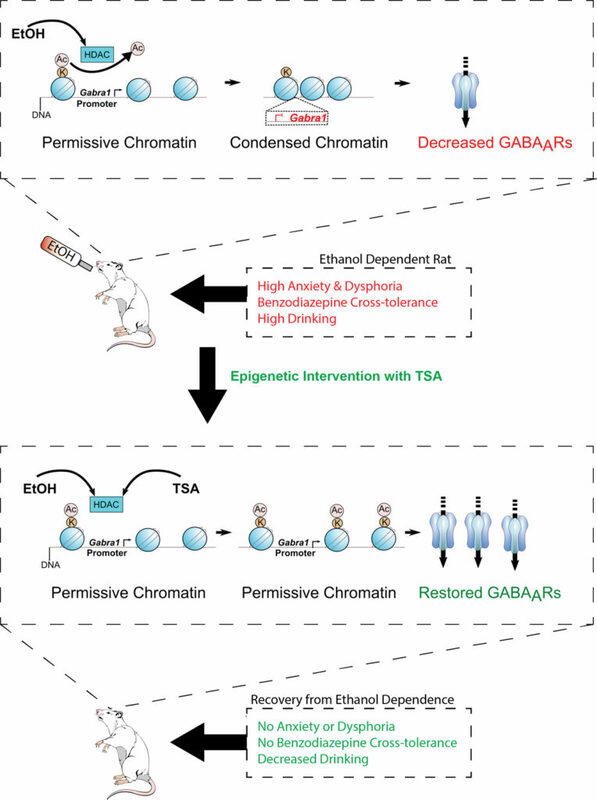 In rats that were made dependent on alcohol through forced consumption or following voluntary alcohol drinking, we found that Trichostatin A, a histone deacetylase inhibitor, prevents increased drinking, anxiety behavior, and the loss of GABAA receptors in the brain. Using electrophysiology to measure the function of GABAA receptors in brain, we showed that Trichostatin A also restored complete GABAA receptor function. This work showed that restoring GABAA receptors and their normal function could prevent the symptoms of alcohol dependence, including elevated drinking. In a companion study, we examined similar processes in neurons maintained in culture to allow the investigation of additional strategies to prevent the deleterious effects of alcohol in the brain. In cultured neurons, we inhibited the expression of the enzymes that deacetylate the histone DNA and this strategy also prevented the ethanol-induced loss of GABAA receptors. Finally, we used a modified version of a technique known as CRISPR Cas9 to deliver the enzyme that acetylates the histone directly at the GABRA1 gene promoter and this strategy also prevented the alcohol-induced loss of GABAA receptors caused by alcohol. Altogether, these three different strategies show that ethanol effects on the epigenome are responsible for the loss of GABAA receptors and correcting the function of the epigenome can be therapeutic for ethanol withdrawal. GABAA receptors have long been known to be important in alcoholism as well as many other psychiatric and neurologic diseases. This study suggests that GABAA receptors in the brain can be protected from damage to the epigenome caused by alcohol, seizures or other insults. This work may lead to better treatment strategies for alcohol use disorders and individuals suffering from alcoholism. Histone deacetylases mediate GABAA receptor expression, physiology, and behavioral maladaptations in rat models of alcohol dependence. Ethanol Exposure Regulates Gabra1 Expression via Histone Deacetylation at the Promoter in Cultured Cortical Neurons.